Almost every aspiring (and successful!) writer has a few volumes of writing advice that he or she feels are indispensable–books we return to, re-read, and use as guideposts on our writing journey. Munteanu’s wonderful book might find that kind of home on your own bookshelf. Beginning writers especially will find The Fiction Writer a resource for every step on the road to writing–from defining genre to writing a great beginning; from outlining and plotting to preparing the perfect submission package. 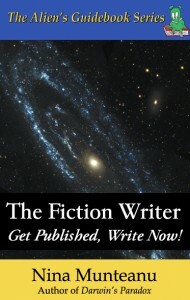 It really is an A-to-Z of fiction writing, starting with the chapter “Alien Architecture: Building from Scenes to Worlds” and hitting every letter of the alphabet right through to “The Zen of Passionate Writing.” Munteanu includes examples and lessons from her own writing career, which serve to emphasize the practical value of her advice. Although the book covers a lot of ground, there’s no “scattershot” feel to the advice. It’s practical and grounded, and liberally seasoned with constructive exercises and helpful lists and tables, such as “The Hero’s Journey Map” (complete with an explanation of three-act structure), “Ten Ways To Revise Your Story,” common sentence structure and grammar errors. Despite the fact that readers may know Nina Munteanu as a speculative fiction writer (Darwin’s Paradox, Angel of Chaos), the vast majority of the advice and information in The Fiction Writer applies equally to writers in any fiction genres. Good writing is good writing, and Munteanu has worked hard to provide a guidebook that shows exactly how to achieve that result. Highly recommended! Thanks for the awesome review, Sherry! I sure enjoyed writing this guide. I wish I had something like it when I was starting out… How about that chapter on R for Rejection, eh? I even showed examples of my own rejection letters in it! LOL! Thanks again!